PITTSBURGH--From a children's hospital in Italy to a charter school in Pennsylvania, more than 14 projects worldwide will get a boost this year from a program designed to provide paint and volunteer workers for renewal initiatives. PPG Industries Inc. unveiled its Colorful Communities program May 29. It did so while company employees, working as volunteers, added coats of fresh paint to the hallways of a charter school near PPG's world headquarters in western Pennsylvania. A PPG employee, working as a volunteer, applies new coats of paint as part of the company's Colorful Communities initiative. The program will provide $10 million over the next 10 years for similar projects, PPG says. PPG reported it developed the program after surveying employees. The company found that community engagement was a priority for those employees who wanted to volunteer, said Sue Sloan, PPG’s executive director for global corporate social responsibility. “It’s a global initiative that will enhance, protect and beautify the communities where we have a presence, utilizing PPG employees as volunteers and PPG products to brighten community assets,” Sloan recently told the Pittsburgh Post-Gazette. Colorful Communities will combine funding from PPG and the PPG Foundation to complete those painting projects. Using employee volunteers and donated supplies, the program will provide new colors for neighborhood spaces such as libraries, hospitals and schools, PPG said. It also will help fund educational programs. In the Pittsburgh region, where PPG employs 2,500 of its 46,000 employees, the company launched its campaign at the Propel Hazelwood public charter school. 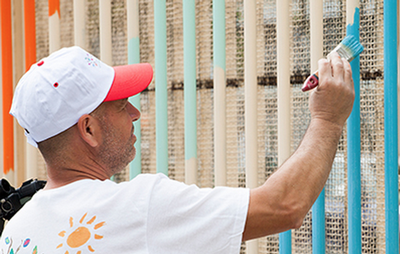 There, 75 employees volunteered 347 combined service hours to apply eight different PPG paint colors. The company funded the project with a $50,000 grant that also will help provide money for elementary school science projects. The Colorful Communities program will provide PPG employees working as volunteers, donated supplies and paint to parts of North America, Latin America, Asia and Europe. All told, PPG said it will work on projects throughout North America, Latin America, Asia and Europe. 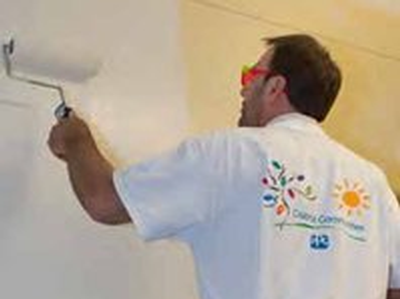 In Alessandria, Italy, for example, PPG is using the Colorful Communities initiative to help a charitable organization paint a 150-year-old children’s hospital with bright, positive colors. The company is working with another organization to build a new youth center in the West Park neighborhood of Cleveland. PPG has its largest automotive coatings plant in West Park. PPG, with 2014 sales at $15.4 billion, now derives 90 percent of its revenues from its coatings business. Bryan Iams, the company’s vice president for corporate and government affairs, told the Pittsburgh Post-Gazette that was one of the reasons PPG chose Colorful Communities when it was developing a signature philanthropic plan. “It was the right time to really leverage that part of our product portfolio,” Iams said.